My week is turning out great! First, I was awarded The Thinking Blogger Award. Then my interview with Bobby Revell was published and is apparently receiving pretty good feedback. And today, My Gallery received a vividly glowing review by Tish over at Blogs We Luv! So you can imagine how deliriously content I am at the moment. So, are you up for the challenge? 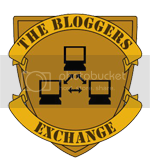 Does your blog have the x-factor? Do you think it has enough allure and magic to be featured in BlogsWeLuv? Pay them a visit and find out. You’ll be surprised at the number of cool sites they’ve discovered so far! Thanks so much for the nice advertisement, Marzie! :) I'm am happy to have discovered your blog! Bobby, you're so sweet :) Thanks! This is my first visit to this particular blog of yours... it's amazing! Amber! *Hugs* Am honoured that you stopped by here :) Thanks so much.